During Steve Jobs’s keynote speech Monday at the Worldwide Developers Conference, he introduced the $5 iMovie for iPhone. In a demo hosted by Apple’s chief architect of video applications, Randy Ubillos—the man responsible for 2008’s loved-it-or-hate-it iMovie makeover—we saw an iMovie that works very much like its fuller-featured sibling, iMovie ’09. Unlike iMovie ’08 and iMovie ’09, however, this mobile video editor may receive a far warmer reception from its intended audience. The iPhone 3GS can shoot and edit standard-definition video, but its editing features are meager at best. The built-in editor acts as a way to trim the fat so you’re not uploading more video than you need to. Using a timeline, you can trim the beginning and end of a clip but you can’t split a video, combine clips, or add opening or closing titles or music. You can then send the resulting clip via e-mail, as an MMS message, or to your MobileMe Gallery or YouTube. The iPhone 4 and iMovie for iPhone app changes that. To begin with, just like such pocket camcorders as Cisco’s popular Flip MinoHD ( ), the iPhone 4 can shoot 720p HD video at 30 frames per second from its rear-facing camera. Unlike the Flip MinoHD and other pocket camcorders, the iPhone 4 includes an LED flash, which works with video as well as stills. It also includes a tap-to-focus feature that lets you easily choose what you’d like the camera to focus on. Digital zooms generally produce unsatisfying results, as the process simply enlarges pixels rather than moves lens elements, but Apple gains bragging rights for offering a 5x digital zoom versus the 2x or 4x zoom offered by most pocket camcorders. The big difference, though, is on-device editing. Today’s pocket camcorders demand that you export video to a computer before you can edit it. With the iMovie app you should be able to edit and deliver fairly polished videos without the iPhone ever touching your Mac or Windows PC. When you see iMovie on the iPhone, iMovie ’08 and ’09 make more sense. It’s as if Apple originally designed them with a touchscreen interface in mind, as much of iMovie seems ideal for dragging and pinching rather than mousing, regardless of the platform it's running on. The iMovie for iPhone app brings a workflow similar to what you find in iMovie ’09. You drag clips from a bin into your project or, if you like, add live video from the iPhone’s camera. Once in the project you can trim clips using drag handles and zoom in when you need to make finer edits. As with iMovie for Mac you can add transitions—a cross-fade or theme-base transition—between clips as well as titles. You can additionally apply up to five themes to your project. You can also add music—canned music that comes with each project theme or music from your iTunes library. It appears that iMovie for iPhone has an auto-ducking feature that reduces the background music’s volume when there’s dialog in the video. And iMovie for iPhone can take advantage of the iPhone’s geolocation talents by displaying the location of the video in the movie’s title. Additionally, you can add still images from the phone’s photo library to your project. By default, the Ken Burns pan-and-scan effect is applied to these images (hopefully the effect can also be switched off) and by pinching and dragging you can configure the direction and zoom level of the effect. The delivery options are no different than what we enjoy now—e-mail, MMS, MobileMe Gallery, and YouTube—though you can choose the resolution of the exported movie (360p, 540p, or 720p). 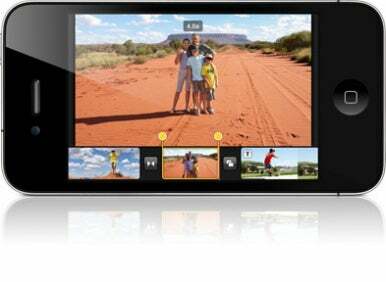 What iMovie for iPhone eventually means depends on a variety of factors—the quality of the iPhone 4’s video, how much trouble it is to edit movies with the app, and how necessary slick-looking videos are to iPhone owners. When the fifth-generation iPod nano ( ) was released—that’s the version of the nano that shoots video—some people predicted the fall of the Flip pocket camcorder. It turned out that the nano shot pretty marginal video, so the Flip and its like lived on. If the iPhone 4 produces HD video that matches or exceeds the quality of the video produced by dedicated pocket camcorders (plus shoots better in low light because of its LED flash) and delivery of videos is as seamless as Apple suggests, Cisco, Kodak, Creative, and other pocket camcorder manufacturers may have to think long and hard about the future of some of their products. iMovie for iPhone looks to be an easy-to-use application. But is it easy enough to use that iPhone owners will take the time to sit down and edit video on a small screen—particularly when a Mac, complete with a more feature-rich video editor, may be just a room or two away? While some Mac users may opt to use iMovie for Mac rather than edit video on their phones, Windows users don’t have this luxury. Windows’ video editing application—Windows Movie Maker—is far more limited than iMovie for the Mac. Because it is, Windows iPhone users may find that they prefer editing video on their phones rather than doing the job on their PCs. And finally there’s the question of whether most people shooting video with a phone care about using that material to create finished videos. Up to this point the typical pocket camcorder owner is someone within the 18-to-24 demographic interested solely in capturing their buddy doing something incredibly stupid (often involving alcohol and gravity) and, within minutes, posting the results on YouTube. For them, simple trim controls are enough. Shoot and post are their watchwords. The iPhone and iMovie for iPhone, with its family-and-friends focus, is likely to change the way people think about portable video—how it’s shot as well as edited. It will be interesting to see if iPhone 4 owners continue to produce polished videos after the novelty of editing video on the iPhone wears off.